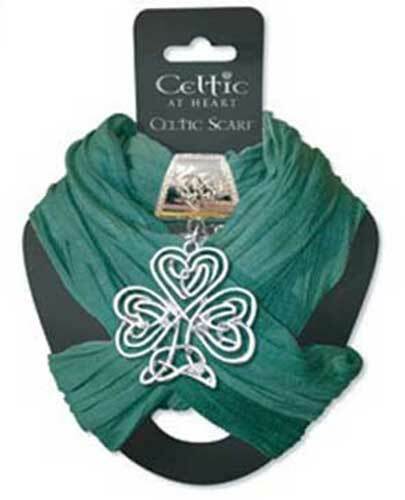 Irish scarf features a silver tone metal shamrock charm that is enhanced with a Celtic knot design. This shamrock scarf is a cotton and rayon blend that measures 18" wide x 70" long. The green Irish scarf is jeweled with a silver tone metal shamrock charm that measures 2 3/4" wide x 4" tall, including the bail. Both the shamrock and the silver tone metal bail are enhanced with a Celtic knot design. The Irish scarf is made in Scotland and it is received with Celtic knot and shamrock history cards, complements of The Irish Gift House. Irish scarf is black in color and features a silver tone metal shamrock ornament that is enhanced with a Celtic knot design. Irish scarf is a green in color and features a silver tone metal Celtic knot charm. Irish scarf is blue in color and features a silver tone metal Trinity knot charm.